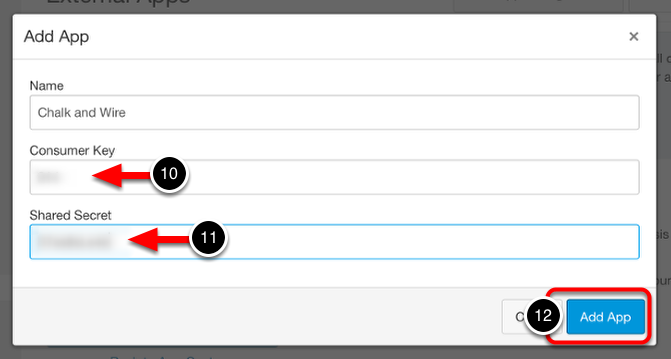 Adding Chalk & Wire as an app will indicate to Canvas that it is allowed to communicate with Chalk & Wire. The app is secured with a "key" and a "secret", which will be provided to you by Chalk & Wire. 1. 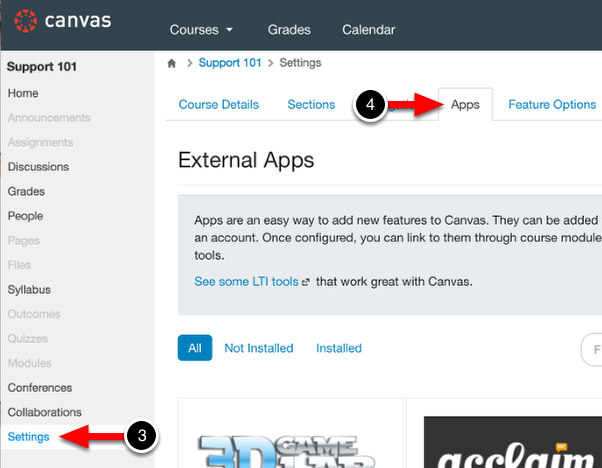 Click on the Courses drop-down menu. 2. Select the appropriate course from the menu. 3. Using the navigational panel, select Settings. 4. On the Settings screen, select the Apps tab. 5. On the Apps screen, click on the View App Configurations button. New buttons will appear where the View App Configurations button had been. 6. Click on the View App Center button. 7. Enter "Chalk and Wire" into the search box. NOTE: Do not enter Chalk "&" Wire - the app store will not recognize the ampersand, and will not provide you with the correct apps (if any). 8. Locate and click on the Chalk & Wire app. Clicking on the Chalk & Wire app will provide you with an overview of the tool. 9. Click on the + Add App button. A pop-up window will appear, and will be used to enter your institution's specific Chalk & Wire information. 10. Enter your Consumer Key. 11. Enter your Shared Secret. 12. Click the Add App button. 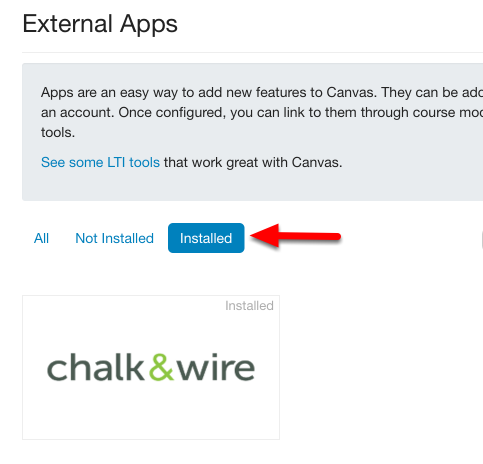 The Chalk & Wire app will now appear in the "Installed" section of the app store.